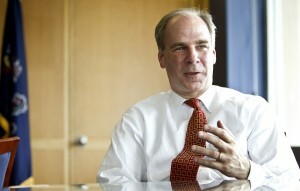 Home » Blog » Freeh Contract? What Freeh contract? Since the Office of Open Records ordered the Department of Education last month to release contracts with Louis J. Freeh, I’d been wondering how it was going to respond. Surely it wouldn’t just hand over the contracts after blocking three previous requests. Somehow it would try to weasel out of doing what it should do. After all, this is Pennsylvania. It didn’t disappoint. Last week, while claiming it doesn’t have Penn State’s contract with Freeh, the department’s lawyers decided to file suit to keep the contracts from the public. As he’s done several times before, Tomalis signed a carefully worded affidavit swearing that he doesn’t have any contracts with Freeh. After conducting a “reasonable search” for the contracts, he concluded he doesn’t have any in his “possession, custody or control. Another affidavit from another administrator said the department doesn’t have any procurement contracts with Freeh. And a third administrator said the contracts could be on a department computer, but it would take way too much time to search for them. It refused to look any further. But in a bizarre move that even lawyers couldn’t understand, the education department simultaneously appealed the OOR’s order to Commonwealth Court, continuing to make the ridiculous argument that a request for contracts “to which the law firm of Freeh, Sporkin & Sullivan, LLP, is a party” isn’t specific enough to make them take action. On its face, Tomalis’ statement looks convincing. It was made under the penalty of perjury, so he must be telling the truth, right? Nah. Sure, it’s possible he doesn’t have the contract. But if he really doesn’t, why in the world would he commit Pa. taxpayers to spending thousands of dollars on court appeals? It would be one of the most irresponsible moves in the history of politics. The strange tactic of simultaneously complying with the OOR’s order and suing to block it is also telling. It would have been far less suspicious to simply let the affidavit speak for itself without challenging it in court. Or, if they really thought the OOR’s order was wrong, the department could have simply appealed it without the extra filing with the OOR. This move, more than anything since I began this battle in September, has convinced me that Tomalis has the contract and is walking a very fine line to avoid turning it over. I don’t think his carefully worded affidavits will hold up in court. And its seems pretty clear that if his lawyers know he has it, they’re breaking rules of the Pa. Bar. If Tomalis would just level with us, this could all go away. If he stopped cowering behind his army of 14 taxpayer-funded lawyers and just said, “hey, even though I co-led the board committee that guided Freeh, nobody ever gave me a copy of the contract,” then maybe we might believe him. But he won’t do that. Sometimes silence speaks volumes. In the end, this isn’t a fight Tomalis and the Corbett administration want to have. Election season is approaching, and it won’t look good to be fighting attempts and making Penn State more transparent. It seems pretty clear to me that Tomalis is saying he doesn’t have the contract in his possession. Not only is it not in the Dept. of Ed.’s files (understandably) but he does not have them in his personal files relating to his service on the BOT. Clearly, Tomalis is smart enough to realize all he needs to do is discard of any copies of the contract he may have ever received, and then he is safe to sign the affidavit. Ryan, have you sent a RTK request to the University for the contract? Josh, don’t let them fool you. If he really didn’t have it, he wouldn’t be doing this. They won’t even admit it one way or the other in the private talks we’ve had. And Penn State is not subject to the RTKL, so no, I haven’t sent them a request. Is anyone from Watergate still around? Seems a break in is called for. So I imagine the next excuse will be “the dog ate it”. This really is a saga. Thanks for not letting up.